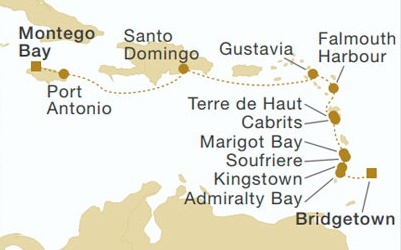 This cruise departed from Montego Bay, Jamaica, sailing to Bridgetown, Barbados over 11 days. I flew from Victoria, Canada to Montego Bay, where I stayed two nights before boarding the ship. After debarking the ship in Bridgetown, I stayed an additional four nights in Barbados before returning home. It was great to visit the Caribbean again, and this cruise introduced me to many new islands. The Caribbean always offers so much to see and experience, and the weather both on sea and land was perfect. If you just want to see photo albums, the 2018 Caribbean Sail Cruise collection of photos covers everything I encountered during this voyage both onboard, ashore, as well as getting there and returning home. My friends had previously experienced several Star Clipper cruises and liked them very much, so they had booked a Caribbean cruise aboard the Royal Clipper, a new ship for them. 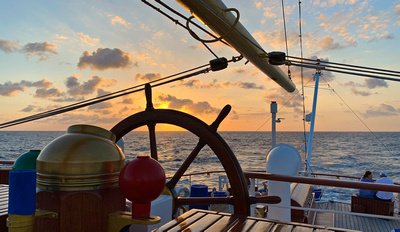 I had experienced the Caribbean and its islands several times and had fond memories of many of the islands, so it wasn’t hard to decide to join my friends on a new adventure for me – cruising aboard the largest passenger sailing ship in the world. An additional incentive was receiving a generous referral discount off the cruise fare thanks to my friends’ previous bookings with the cruise line. Finally, this particular itinerary offered me mostly new islands to visit, save the terminus in Barbados and St. Lucia, both of which I had visited before. I booked a basic ocean-view stateroom directly with Star Clippers, who have a site specific to their Canadian clients – a very nice touch, since they quote in Canadian dollars. In addition to the discount from my friends referral, Star Clippers also offered to waive the Single Supplement (normally 50% extra). This greatly reduced my per-day cruise costs, which ultimately motivated me to spend a little more on extras while aboard the ship. I booked shore excursions while onboard for many of the ports-of-call. Most of the excursions worked out well, with only a couple I wouldn’t recommend. 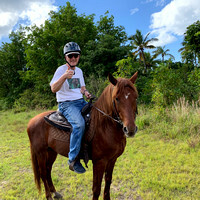 I find taking shore excursions when travelling solo is a good idea, since I don’t have to spend precious time ashore trying to find others to share taxi rides with, or alternately going off on my own and possibly missing major sites. This particular cruise was very reasonably priced when compared with my previous cruises with Holland America and other cruise lines. After the referral credit from my friends and the waived single supplement, the fare for a basic ocean view cabin was under $350/day. Flights to and from the Caribbean, staying 6-nights at both ends of the cruise in hotels and vacation rentals and a rental car in Barbados only brought the cost up to just under $400/day. Prices quoted are in Canadian Dollars – discount about 35% for US$ equivalent. Barbados is my favourite Caribbean island, so I arranged to stay for four nights in a vacation rental on the south coast of the island. I also rented a car, so I could reacquaint myself with the many interesting sights the island offers, and meet her friendly people. Jamaica is a new Caribbean island for me. My friends and I stayed in an all-inclusive resort for two nights about half way between Montego Bay’s airport and seaport. There was a wonderful sandy beach to enjoy located right across the road, in addition to the hotel pool. This was my first time staying in an all-inclusive property, so I enjoyed many of the delicious menu items and drinks, the good Internet was much appreciated, and the transfer from the airport was also included at no charge. 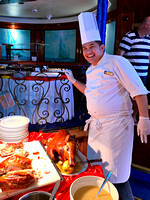 Star Clipper cruise line really offers something different than the other, bigger cruise lines. Their crew provide the personal touches for passengers, since there are only a maximum of 227 guests aboard. The highlights of the trip for me have to be the wonderful meals on the ship, the good company of my friends, meeting quite a few fellow travellers, and having new and fresh experiences both on board and ashore. Sailing on such a beautiful vessel compelled me to take way too many photographs of the ship!